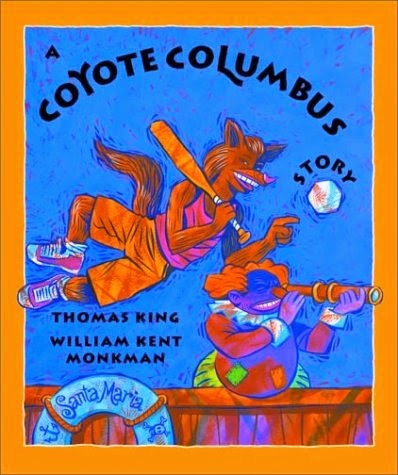 "I'd just like to point out that I'm very very fond of "A Coyote Columbus Story" by Thomas King. 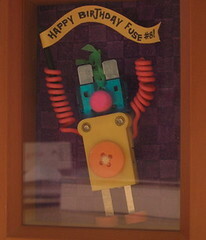 If you haven't seen this picture book, you might do well to give it a glance." King's book is terrific. My dear friend and colleague, Jean Mendoza, has an essay about it in A Broken Flute: The Native Experience in Books for Children. The essay, titled "Goodbye, Columbus: Take Two," discusses A Coyote Columbus Story and Jane Yolen's Encounter. A gifted writer, Jean deftly critiques both books. Yolen is a powerful name in children's literature, and she's written many excellent books, but as Jean points out, Yolen's attempt to give readers a Taino perspective on Columbus ends up blaming the victim. A Coyote Columbus Story is no finger-pointing lament. None of its characters slouch in defeat with body parts morphing into thin air, as does the narrator at the end of Encounter. The reader sees indignation, not stoicism, on the faces of the people being kidnapped. Your school or public library probably has a copy of Yolen's book, but not King's. Order a copy of A Coyote Columbus Story and a copy of A Broken Flute and read Jean's essay. You will gain insights that you can apply to other books. And now it's out in paperback! No reason not to buy it in bulk, says I. Interesting; I really like the message and the pictures. I'm definitively going to buy it! "Cowboys and Indians" and "Tacos and Tequilas"